Have you noticed the way that the current media push for Australia to go nuclear by the unreconstituted technocrats often takes some very strange twists? In this sales pitch we've had neo-liberal politicians saying that nuclear power is the solution to global warming, without even bothering to do the economics sums, or acknowledging that nuclear power is more expensive than solar or wind. 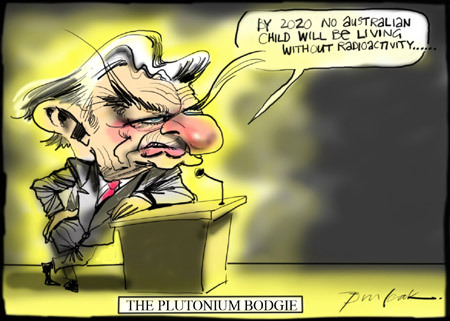 Others are saying that we should sell as much uranium to China, not to solve Australia's balance of payments, but to have a say in preventing China from becoming a nuclear power. Others reckon that Australia can make lots of money by becoming the dumping ground for world's nuclear waste. When I listen to all this reborn political enthusiasm for all things nuclear I reckon these salesman and spruikers have lost it. As they step back into the past they've lost any understanding of what life is about, or that politics is about achieving the good life. It is a technocracy that talks the language of redemption whilst boasting that nuclear power is the cheapest power available. The boast is based on the old smoke and mirrors trick of counting the cost of operating the nuclear power plant, not of constructing them. Nuclear power plants are very expensive, due to the cost of borrowing money for the decade or more that it takes to get these plants up and running. So massive government intervention and subsidy is required. That 's where the technocracy bit surfaces with its intermingling of scientific-technical rationality, power and culture. This is very grave. I wish the government will do something really soon to ractify this.